Joshua Ferris' The Unnamed isn't exactly a cheery book. It's practically a polar opposite from Ferris' first novel, a literary version of the movie Office Space titled Then We Came To The End — a National Book Award finalist that had readers rolling. The Unnamed, however, will have no one rolling in the aisles. Essentially, the novel explores the limits of "in sickness and in health" in a marriage. Tim is a successful New York lawyer who has an unexplained, "unnamed" condition whereby his body forces him to stop whatever he's doing and just walk...walk until he gets tired, curls up and falls asleep. Then, he calls his wife Jane to come pick him up at the gas station or side-of-the-road rest stop or beauty salon (in one memorable case) where he's collapsed. The condition goes in and out of remission, and the resulting hope-despair cycle wreaks absolute havoc on Tim and Jane's marriage. Jane turns to the bottle to cope and escape, proving she's just as vulnerable as he is. Their marriage is a perfect example of co-dependence — until conditions spin out of control. The book was solid, but certainly not great, and not as good as Then We Came To The End. Even so, it's clearly the product of an immensely talented writer with a brilliant imagination. 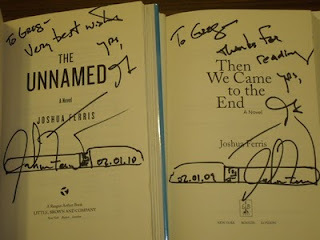 Speaking of the writer: You may remember from a recent post that I got to meet Joshua Ferris at a reading and signing last week. Ferris read for about 30 minutes — his voice (I'm fascinated by novelists' voices, for some reason) is a clipped, brisk, medium-soft baritone, exactly the type of voice you'd expect from the trendily-but-casually dressed, pleasantly-dishevel-'doed intellectual hipster. He took only a few questions, during which he revealed he wrote the ending of the novel on his Blackberry while on a shopping trip to Home Depot with his father. Then we got in line to have him sign our books. I tend to get a bit star-struck when meeting talented novelists, and had been trying the whole time he was reading to think of something smart to say when it was my turn. Not to be. He did this thing where he'd trace his pen, and then sign inside the tracing, and so all I could come up with is "Is there a story behind the pen-tracing?" Smooth one, Greg. He kind of smirked and said "I'm sure there is, but I've been doing it so long I can't remember why I started." Whenever I meet an author I also try to think of something to say that won't be said by 100 other people. It usually doesn't work out for me either! Thanks for the review...I just won an audioversion of this book and I'm looking forward to it. Very cool. I've met so few authors, I get a vicarious thrill looking at other people's signed books and hearing their stories! What a great picture of signed books! I have heard rave reviews about The Unnamed so I'm really impressed you think his previous book was even better. Maybe I'll read Then We Came to the End first, then. @Michelle - It's always a lot of fun - highly recommended whenever the opportunity arises! @Aarti - If this sweetens the pot any, Then We Came To The End takes place in Chicago! I'd love to hear what you think of it if you pick it up. This book looks really interesting... it's going on the list. I love that he wrote the ending at Home Depot! The joys of writing in the internet age. Great, another title for the wishlist. This look good. My husband has a chronic illness so I'll be able to relate! How are you enjoying the Book Thief? One of my all time favorites, just completely amazing! @Kerry - Yeah, just another example of how inspiration can strike anywhere. The way Ferris told the story was absolutely hilarious, too! Another great review Greg! Bravo! I have seen this book on many "Currently Reading" sections of peoples blogs but yours if the first review I have read of The Unnamed. I am intrigued. I notice that you are currently reading The Book Thief. I am really looking forward to your review because I enjoyed that book SO much!!! Great review, Greg--although it's bad news for me because it's another reason why I should go out now and get this book. I figured it was a sign that I saw it stocked in the bookstores here (I live in the Philippines, and new releases take months to get here, hay). I was thinking about how great it is that he pulled off the whole made-up sickness kind of thing. The only other book in my head is Niffenegger's, and I'm still on the fence about TTW. I went to his booksigning in Denver and I had the same problem you did. I didn't come with anything original to say, but I was relieved that I wasn't as inane as the woman right in front of me, who said, "How was your flight?" He answered, "Horrible," and all she could say to that was, "Oh, that's too bad." He was a pretty funny guy, actually. I would assume that the Chicago booksigning was probably a bit more peppy than the one we had out here, since he lives in Chicago. @Lindsay - Yeah, he seemed fired up to be in Chicago (I think he actually lives in NY now, but you're right, he's from the Chicago 'burbs) and a lot of his family and friends were in attendance. I asked him if he ever followed any blogs that wrote about him (I first heard about him through the A.V. Club) and he basically said, "Hell no." I was glad I came up with something better than, "So do you miss Chicago?" (which was also asked).